What’s more fun than using your unsuspecting friends to test out a new and unusual recipe? (This is a rhetorical question; please do not answer because I suppose getting a massage, winning a lottery, going on vacation are all valid answers). Last night I rushed home from work and had exactly 20 minutes before leaving for a dinner date with friends. I used this time wisely and made Chocolate and Tahini Cakes from one of the most beautiful food blogs online, La Tartine Gourmande. What makes this recipe unusual is the use of tahini paste and millet flour instead of the usual butter and AP flour. My variations to the recipe are as follows. I used three large eggs instead of 2 extra large; Ghirardelli’s 70% cacao extra bittersweet chocolate bar for the melting and in place of the milk chocolate pieces; regular granulated sugar, I sifted the millet flour, I used 4 ramekins instead of 3 tea cups (I could have easily stretched the mixture to 5 ramekins). I baked at a slightly lower temperature of 415F mainly because I don’t trust my oven dial. I poured about half inch of water in the baking pan so that the ramekins would cook evenly. The result was heart melting. The tops of the cakes were firm while the inside was gooey. 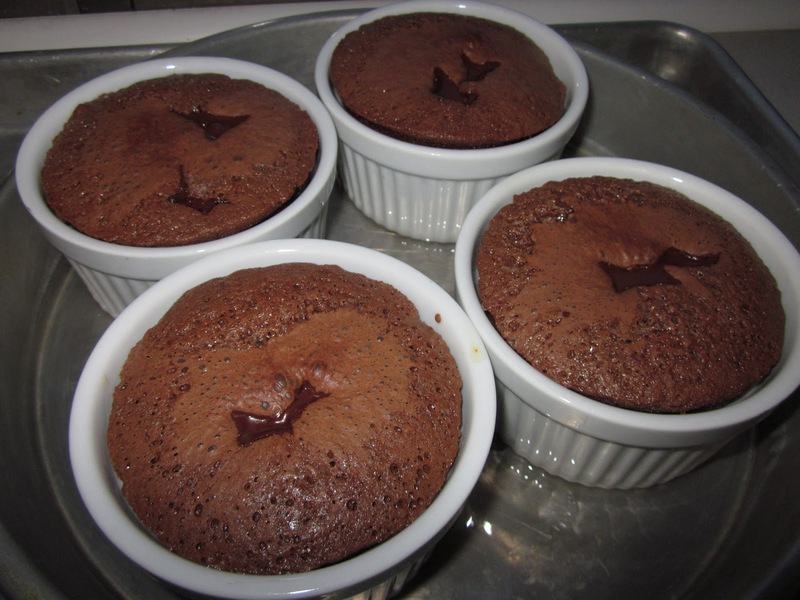 The chocolate pieces had sunk to the middle in the baking process and added another dimension to the gooey-ness. The tahini and the millet accentuated the chocolate flavor without making everything too sweet. Every bite was rich and heavenly. I couldn’t concentrate on what my friends were talking about while I ate it. I think Sachin was talking about his recent trip to Bangkok and what he learnt about himself while hiking and diving and…blah blah blah blah…. It took me about 7 minutes to assemble the ingredients and another 10-13 to bake. Child’s play really! Devang is particularly excited with the possibilities of having a dessert-on-demand. Angel, these are gluten free darling! For the recipe, please head over to La Tartine Gourmande using the link above or on the sidebar, because I think you really need to see this blog. If you try this recipe, please send me pictures and your thoughts on how it tasted. I am headed to the gym for a 5-6 mile run before meeting friends for dinner. Hope you have a fun, relaxing, and delicious Friday evening too.